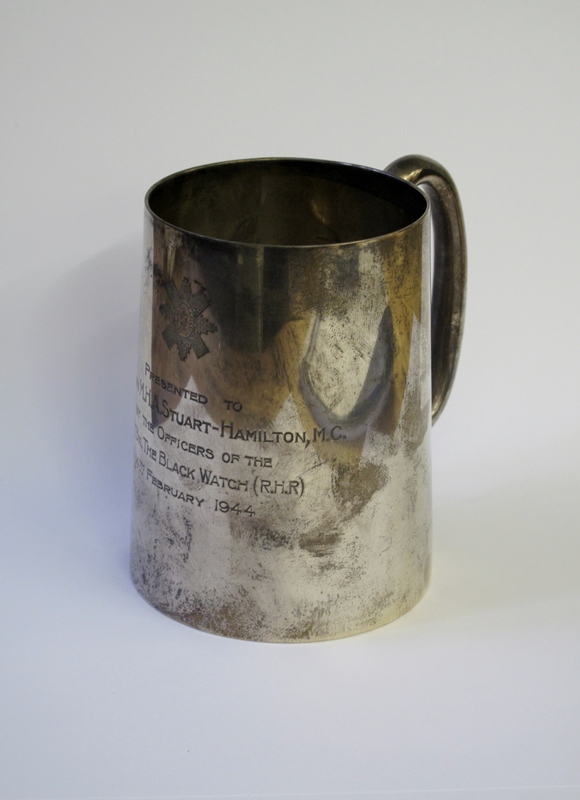 The object we offer today for your delectation is a silver tankard presented to Captain Stuart-Hamilton by his fellow officers of the 5th Battalion Black Watch on 14th February 1944. Captain Stuart-Hamilton was given his Second Lieutenancy as an Emergency Commission on 28th December 1940. Emergency Commissions were granted during the war as a speedy way to increase the number of officers in the British Army, with some 250,000 begin granted between 1939 and 1945. He was commissioned Lieutenant on 28th June 1942 before finally being killed, as a Captain, on 12th June 1944. The 5th Battalion Black Watch landed on Juno beach at around 8pm. By this point the beach-head had been established and as a result the 5th were ordered to march off the beach and then east towards Banville, where the rest of 153 Brigade was to assemble. The landings had not gone without incident, indeed Major East had succeeded in tying the waist cord of his waterproof trousers so tight that when he entered the water they ballooned, upset his balance and set him bobbing, upside down, in the sea. Only the quick actions of his batman, Private Hurst, who promptly turned him the right way up, saved his life. The night of the 7th June saw the Luftwaffe attempt to bomb the beaches but the 5th were able to rest as there were no Germans in their immediate vicinity. However the next day the battalion was ordered to assist in the attack on a German radar station at Douvres which was stubbornly holding out. With the support of Sherman Tanks from the County of London Yeomanry, the 5th launched a fierce attack on the woods around the station and were met by sporadic counter fire. It was only when a broad Canadian accent ordered them to cease fire did the Black watch find out that the ‘enemy’ in the woods were in fact soldiers from the North Shore Regiment of Canada. It was later stated that a large cache of wine and camembert discovered in the woods may well have contributed to the doggedness of the Canadian defence. The attack on the woods at Douvre was a sobering lesson on the importance of up to date information, which led to the Battalion losing seven casualties. Not being given time to dwell on the narrowly avoided disaster the Battalion were ordered to support an attack on the known German positions, which was beaten off. In fact the radar station at Douvre was not to fall for another month. On 9th June the 5th were relieved by the 5th Camerons and the Black Watch were ordered to march towards the eastern sector of the Allied perimeter. This sector was focussed on the defended towns of Brèville, Ranville and Herouvillette. At this point the area was being defended by the 6th Airborne Division but they were coming under increasingly heavy pressure from the German 346th Infantry Division. The 5th took up position around the chateaux at Brèville and prepared a defence. From the 10th to the 13th June the Battle of Brèville reached is climax, culminating in the afternoon attack on the 12th, which came so close to unpicking the Allied defence and threatening the entire sector. The 5th in position alongside the 9th Parachute Battalion came under heavy artillery fire at around Noon on the 12th. At 3 O’ clock in the afternoon the German infantry launched their assault against the British lines supported by tanks and self-propelled guns. Very quickly the Bren Gun Carriers of the Black watch were destroyed along with their anti-tank guns, as a result the defence had to rely on small arms fire and mortars. Under fierce pressure the 5th Battalion lines began to buckle and they were forced to withdraw back towards a defensive position at the Bois de Mont. At this point a request for aid was sent to Brigade headquarters and Brigadier Hill led a counter-attack by Canadian forces which succeeded in helping to drive the Germans back. By 8 pm the Germans had been forced to retreat leaving their dead in piles all along the battlefield. One Black watch officer was to later call the Battle of Brèville ‘one of the nastiest ever fought by the battalion in North West Europe.’ The cost to the 5th Battalion had been heavy with some 20 killed and 90 wounded. Amongst the dead was Captain Stuart-Hamilton. This entry was posted in Artefacts and collections, Christmas, Second World War and tagged Black Watch, military, museum, Second World War, The Black Watch, The Black Watch Castle and Museum, The Black Watch Museum. Bookmark the permalink.